Brakes: four-wheel hydraulic drum brakes. Born on the 9th of December 1953, this numbers matching special XK-120 SE has been ground-up restored, to correct standards, with a great deal of time invested into the body and paint work alone. The core car was an extremely original car with all the proper dates on the Lucas electronics to support the build date. Finished in a lustrous Pastel Blue, the Red Connolly leather interior and Wilton carpets are complemented by Smiths instruments to complete this sporty look. The same attention has been paid to rebuilding the engine, gearbox, differential and suspension components. Optional Lucas fog lamps and fender mirrors augment the exterior, while the painted Dayton wires are wrapped in Blackwall tires, and a stainless dual exhaust was also installed. For this build, the goal was to be as correct as possible. Work started with an acid bath to strip the paint and rust, and whenever possible the original nuts and bolts were stripped and re-blackened (per original plating style of the 50’s). It is correct and proper from the authentic Smith heater (with a new core), the Trico washer bottle and bracket, Bakelite battery covers, cloth-covered wire loom, BAS interior kit with Wilton wool carpets and Connelly leather, and a custom blue hood to match the Tonneau cover. It has upgraded torsion bars, leather gaiters, and brass lined brake cylinders. 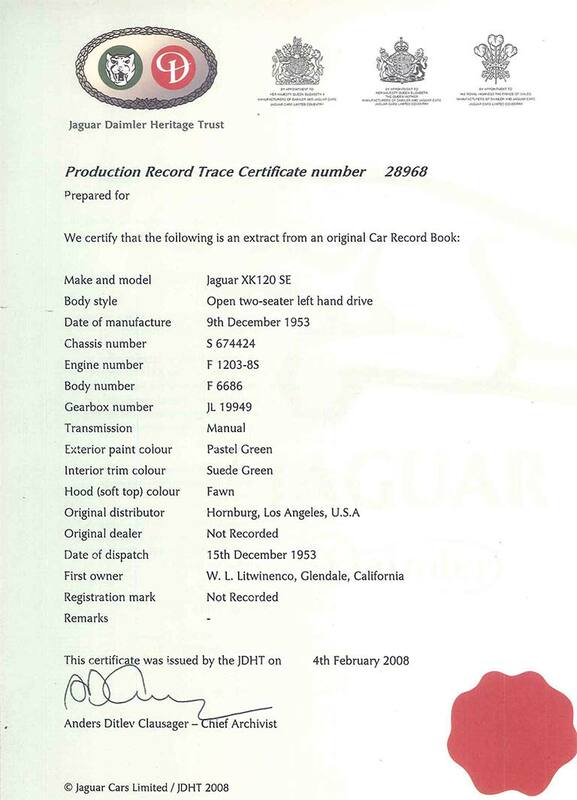 Accompanied by a restoration photo book, restoration invoices, tool roll, sales brochures, Jaguar Operating & Service Handbook, along with a Jaguar Daimler Heritage Trust Certificate. 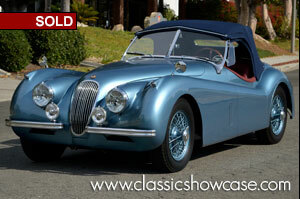 This XK-120 Roadster is ready to be admired, shown, and enjoyed by a discerning collector who seeks a fine example.